I have been evaluating how each of these styles works in the project management arena. Here is a description of the coaching style as applied to project management. The coaching style focuses on personal development, rather than the accomplishment of tasks. A PM with a coaching style sees the project as the vehicle for the development of the members of the team. The goal of accomplishing the project is almost secondary to the goal of helping people to learn and grow. The coaching style reminds me of what Marcus Buckingham wrote about Dr. Donald Clifton of The Gallup Organization in his book The One Thing You need to Know. Dr. Clifton said about the American Management Association. He said that the AMA should change their slogan from “Getting work done through people” to “Getting people done through work” . The point of the statement is that the work or the project is the vehicle that we can use to help people stretch, grow, and develop. I had an excellent manager for several years named Robb who was a terrific example of the coaching style. We worked together on three large projects over the course of about four years. Robb showed great interest in my development and he encouraged me to develop and share with him my long term goals. He showed how my current assignment would benefit me and how it connected to my long term goals and objectives. One hallmark of Robb’s style was his use of the one page weekly objectives. 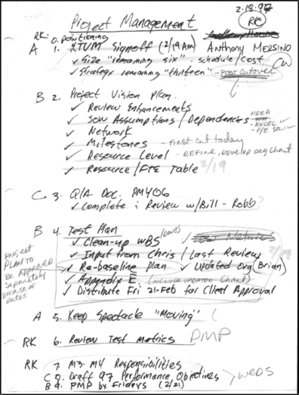 He even broke the project down into one-page weekly objectives. We would sit down each week together to develop the objectives. We started by reviewing the objectives from the previous week, discussing in detail the progress that was made and any hurdles or issues. Then we would jointly set the objectives for the next week. An example of the one-page weekly objectives is shown below. Though this may appear cryptic because of the use of shorthand, we both understood precisely what the document meant. For example, in the figure below, the A’s, B’s and C’s reflected priority. The initials at the top of the page indicated that both of us were committed to the goals. The one-page objectives are not necessary to use the coaching style. What is necessary is to be involved at the detail level. The coach helps the team member with specific steps and provides encouragement and feedback as they perform. Another key to the coaching style is belief in the ability of the team member. I always felt that Robb firmly believed that I could do anything. He didn’t seem to think that I had any limitations and his one-page weekly objectives often included stretch goals that I would not even have attempted had he not encouraged me to believe they were possible. Robb’s belief in me encouraged me to try to accomplish the goals even when I didn’t think they were possible or didn’t see a way to make them happen. Once when I was working for him I ran into some trouble meeting key project milestones. I wanted to take the easy route of simply pushing out the schedule which would delay the entire project, cost my company money, and disappoint the client. Robb told me flat out to go back to the drawing board and come up with a solution that did not involve delaying the project. His confidence that I could do it encouraged me to go look for that creative solution. I didn’t know better and chose to believe that there must be a creative solution if Robb thought that there was one. It is easy for me to understand why the coaching style leads to high motivation levels for the team members. I felt motivated to meet the high expectations Robb had for me. I wanted to do what he asked me to do. In fact, I continually raised my own internal standards and expectations based on his expectations for me. If he thought I could do it, then I chose to believe that I could. The coaching style works best when employees seek direction and feedback and are willing to partner very closely to get agreement on the work to be performed. It requires a high level of trust between the coach and the team member. The coaching style doesn’t work when trust is lacking, when employees are not interested in getting input on their performance, or when they feel micromanaged. On a recent project, I consciously applied the coaching style to 4 different junior members of the same team. With two of the members, I was very successful. Those two team members saw our work together as an investment and kept requesting feedback on a regular basis. The coaching style failed with the other two team members who saw the same style as de-motivating, critical, and micromanaging. These two team members who did not like the coaching found it demeaning. They wanted to have the latitude to work without checking in with the boss. The difference that I saw in the relationships where it worked and where it did not work was the level of trust. In those cases where the employee thought I had their best interest in mind, it worked great. When the employee did not feel that I had their best interest in mind, it failed. You have helped me a lot with my team. thank you for sharing.